Ramallah (Palestinian Territories) (AFP) - The European Union's top diplomat Federica Mogherini said on Saturday that Jerusalem "should be the capital of two states", as tensions gripped the holy city hit by Israeli-Palestinian violence. 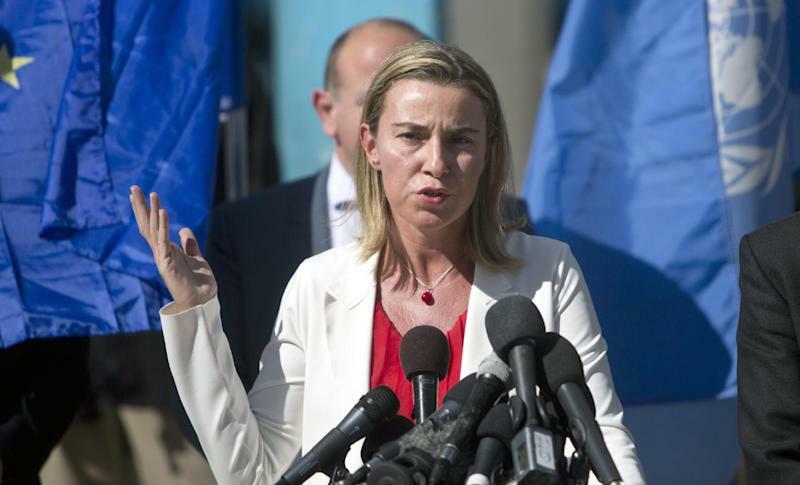 "I think Jerusalem can be and should be the capital of two states," Mogherini told reporters in the Israeli-occupied West Bank city of Ramallah, touching on a sensitive issue that has blocked peace efforts for decades. Her appeal, at a joint news conference with Palestinian prime minister Rami Hamdallah, came hours after the killing of an Arab-Israeli by police fanned tensions between Israel and the Palestinians. The shooting in northern Israel came after another night of clashes in east Jerusalem between youths hurling stones and firecrackers at police, who retaliated with rubber bullets, stun grenades and tear gas. The violence has spiked as Israel has pushed ahead with its policy to build Jewish settlements on lands the Palestinians want for a future state and against the background of efforts by Jewish extremists to secure rights to pray at Jerusalem's Al-Aqsa mosque. "The message is not for the people who live here, the message is to the rest of the world," she said. "It is not a Palestinian-Israeli situation, it is a global issue." On Friday, Mogherini met Israeli Prime Minister Benjamin Netanyahu who dismissed her criticism of Israeli settlement building in annexed east Jerusalem and the West Bank. "Jerusalem is our capital and as such is not a settlement," he insisted.